The Glenn Miller Story tickets are available now. 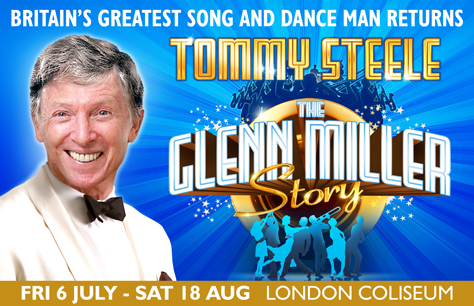 Do not miss your chance to see Rock legend Tommy Steele return to the West End stage! Glenn Miller was the best selling recording artist in the world from 1939 to 1943, leading one of the best known big bands. In those four years he scored 23 number-one hits – more than Elvis Presley and The Beatles. Tommy Steele landed his first UK number-one with Singing the Blues in January 1957, reaching the top spot before Elvis, the same year he filmed The Tommy Steele Story, one of Britain’s great rock ‘n’ roll movies. His career has included over twenty hit singles, twelve hit musical movies – including Finian’s Rainbow, The Happiest Millionaire, and of course Half A Sixpence – and countless award winning stage musicals such as Half A Sixpence, Hans Andersen and Singin’ in the Rain. Tommy starred in the musical Scrooge, which enjoyed two successful runs at the London Palladium, and made him the theatre’s all-time record breaking performer, having headlined more performances than any other star in its history. Book The Glenn Miller Story tickets now to avoid disappointment and ensure the best seats at the best prices!